The Solos are smartglasses built for cyclists that will also appeal to runners too. After a successful Kickstarter campaign way back in 2017, the smart specs that display workout metrics in front of you, has rolled out to backers and are now available for anyone that wants a pair. Looking like a bit like a sporty version of Google Glass, Solos will let you see key running and cycling metrics like pace, heart rate and power without having to take your eyes off the road. The iOS and Android-friendly wearable also plays nice with other Bluetooth or ANT+ devices and Strava with voice controls to help you take charge of what you'll see when you're out for a ride on a run. They started life as a secret venture called 'Project Rio', which involved testing by the US Olympic cycling team, so it's been put through its paces by some of the best riders in the business. But do the $500 Solos smartglasses cut it for the average cyclist? We've been putting them to the test to find out. Like Oakley's Radar Pace specs or the Everysight Raptor glasses, the Solos look like a regular pair of cycling glasses. The key difference is that protruding arm, which holds what's called the invisible optic. The display itself is smaller than 4mm, which is smaller than the size of your pupil. So when you look at it you actually see through it and see around it and it doesn't block or distract you. If you've ever tried Google Glass, the Solos will feel similar; you get that tiny, floating rectangular display, which our eyes needed a few moments to adjust to. The glasses themselves weigh in at 65g, which is impressively low for the amount of tech they are packing. Put them on and they feel instantly comfortable, almost like a regular pair of sports sunnies. The nose arch is fully adjustable, and the arms sit snugly against the side of your head. The only downside to the Solos’s design is that the arms are non-foldable. Presumably due to the onboard tech, which is largely housed inside the arms, but it does make them slightly trickier to transport, and they don’t come with a hard-shell case you can store them in, so accidentally dropping them suddenly becomes a major concern. All that is provided in terms of protection is a padded-cloth wraparound for the lenses. Adjusting the HUD (heads-up display) is the first thing you will be asked to do when wearing the Solos specs for the first time. It’s easy to do, and simply involves moving the optics module arm up and down, horizontally and tilting until the 5-inch display screen is projected upright in your right-hand lens. Once visible, the data on the screen is clear and very crisp, the metrics are easy to read and the content is bright. In no way does it interfere with your view of the road ahead – it sits unobtrusively in the upper right-hand corner of your vision, and you can focus in and out of it as you need to. You can also fit prescription lenses if required, and the glasses come with a pair of yellow-tinted lenses you can swap in when the light conditions demand it. Pairing sensors is relatively painless – you can sync cadence, power and heart rate, plus a foot pod for running, via the Solos app. Sensors need to be Bluetooth or ANT+ to be connected. The metrics I chose to view while riding were distance, calories, elapsed time, average speed, power and heart rate, split over three screens that rotate every few seconds. The immediate benefit of a HUD like this is that you no longer need to look down at your bar-mounted computer to check your speed as you fly round a hairpin bend, meaning an increase in safety and convenience. Once you have experienced this you’ll be reluctant to go back to your old eyes-off-the-road-ahead way of cycling. The glasses will need to be paired with the Solos companion app on rides, and they take GPS data from your phone. This can drain your phone’s battery life, so you may have to carry an additional power pack if you’re on a long ride. Additionally, the makers claim a five-hour battery life for the glasses, which clearly won’t be long enough for some rides. One of the nicest features on the Solos glasses is the ability to make it easier to navigate a route without averting your eyes from the road. From the main screen in the app, you can select three ways to navigate: by entering the address manually, following a saved route or following a previously completed ride. The glasses will then prompt you when you need to make a turn, and will even provide street names in address-based navigation mode. It worked well both in running and cycling modes on a series of unfamiliar routes and is definitely a highlight for these specs. Riders also have the option to control the glasses via your voice. All you need to do to activate the feature is make sure it's switched on in the Quick Settings screen from within the app (while your glasses are on and connected). Once that is activated, you can start your ride (or run) by saying ‘Start ride’, and then get updates on metrics as you work out, simply by saying ‘Show [metric]’. You can also connect and chat together during a group ride or run, like a live version of a WhatsApp group chat. This is a unique feature that will no doubt prove popular in particular with cycling club group rides. Up to 10 users can communicate at a time, so if you’re lagging behind you can be ‘motivated’ to catch up by other group members encouraging you. As well as making group communication possible, the speakers in the arms also provide live activity updates, and allow you to listen to music as you ride or run, or even take phone calls. Clarity and sound quality is decent but by no means perfect, but crucially it lets in ambient noise too so you're not entirely drowning out your surroundings. 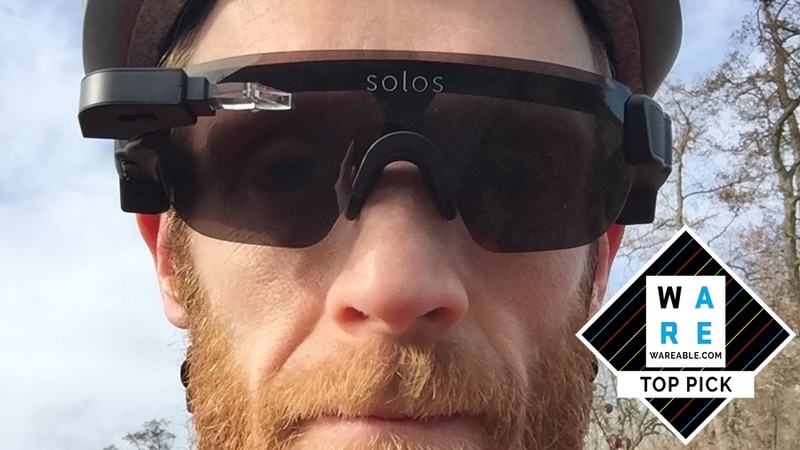 For those of you who take your training seriously, the Solos glasses can also sync with TrainingPeaks. This is a paid-for subscription service that supplies structured training plans for athletes. You can access a huge bank of workouts and plans, or even create your own. Once you have begun your workout, the Solos glasses will tell you what your power/heart rate/cadence should be (depending on what you are working to) and how long you should be cycling or running for at that metric. After the workout is complete, you can then analyse your data or even share it with your coach so they can analyse it, too (and make you work harder). Crucially, the Solos glasses are not just for cyclists – runners, duathletes and triathletes will be pleased to hear they are fully set up to track your activity off the bike, too. Simply switch between ‘Cycling’ and ‘Running’ in the app and you’re away. The glasses will track all the data Strava does: speed, distance, elevation, heart rate (if you have a sensor), and if you have a foot pod sensor attached to your shoe, it can send cadence and pace length to the glasses and app. I had issues with the glasses bouncing slightly while I ran, though, even after fiddling with the nose arch to make them fit better. This made it hard to read the HUD due to the movement of the glasses. However, the voice updates on my progress were useful. The Solos app is required to pair with your glasses for rides and runs, and is available for free on iOS and Android. The app itself is fairly minimal and very easy to use. Once you have chosen to run or cycle, and your sensors are all paired (which is achieved in two clicks), you simply press ‘Start ride’ and you can begin your workout. The list of your activities is easy to access, and syncing with Strava is achieved by just logging into your account and allowing the app access to your data. But as with other smartglasses apps, you really need Strava to make the most of the data recorded as what’s presented here is fairly basic and hard to analyse. Once you save your ride, the activity is synced directly to Strava or Under Armor’s MapMyFitness. One interesting feature is that you can also scroll through past Strava rides from your account on the Solos app and then download ones that you would like to repeat. You can then ‘Ghost’ the ride simply by pressing ‘Ghost Ride’. This means you can race against your previous performance, and the glasses handily update you on whether you are ahead or behind your ‘ghost’, and by how much time or distance. It’s like re-living your Mario Kart days in real life. Solos Wearables claims battery life for these glasses is around five hours, which is long enough for most rides although it seems like it's a little optimistic. On a two-hour test ride the battery went down to 55%, so a full five hours might be pushing it. But battery life is saved by not having to access GPS on the glasses themselves. However, by doing that they are transferring battery worries to your phone, which will also be drained after tracking GPS for a four-hour ride. So that's worth keeping in mind. The Solos are great at what they set out to achieve and that's to bring useful cycling metrics all while keeping you from fiddling with your phone or your headphones. They're light and comfortable to wear, the HUD offers great clarity and features like group chat and the Strava integration also give them added appeal too. While it's a shame there's no built-in camera or GPS, we'd pick them over the pricier Everysight Raptor specs if you're a cyclist looking for some cutting-edge tech that doesn't live on your wrist or your handlebars.